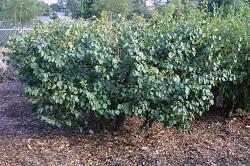 Fruit bushes are standard (full-sized) trees or, preferably, trees on dwarfing rootstock. They are kept small by periodic summer pruning. This method can work for most fruit species. The benefits of this system are that trees are managed without a ladder and multiple species and varieties can be grown in relatively small areas. Trees are planted bare root and headed to knee height. In late spring, cut new growth in half, and do so again in the summer. Be sure to thin out the branches, especially near the top of the tree, to allow sunlight to reach the lower fruiting wood. Allow the tree to grow only as tall as you can comfortably prune and manage the tree from the ground.